Here comes the Next Limited Vinyl of WALL MUSIC. 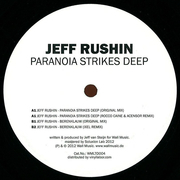 JEFF RUSHIN - PARANOIA STRIKES DEEP ON AND ON - Jeff is currentlly focusing on his famous ON sell-out parties, specialising in underground locations, which breathe techno! ON represents a powerful mix of electronic music, a sublime atmosphere and unique location allowing the DJs to really immerse the crowds into the underground techno scene! ON has invited well-respected DJs including Chris Liebing, Gary Beck, Tommy Four Seven, Brian Sanhaji, Monoloc, PSYK, Mike Wall, Ixel and Rosie, together with talented local DJs, triggering an amazing breadth of sound. 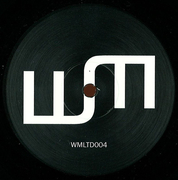 Remixers are Rocco Caine from Drumcode & Acensor from Raw Audio and Ixel from Wall Music & Genesa. Paranoia strikes deep and Berenklauw(Original mix) are my favorite. can't wait to play the vinyl. thank you for sharing Mike. strong release! Thanks, will test this one! Ixel remix is my fav but the whole release is great :) tnx for sending! Another BIG Ep from WMLTD!!! Rocco Caine & Ascensor Remix For Us! Great atmospheres troughout the whole Ep! Nice one, Ixel remix and Berenklauw works fine for me. Good. Ixel remix for me. Thanks! this is a really lovely release, the originals and remixes. love it! My fav is Rocco Caine & Acensor remix!! Thx so much!! Bereklaw is the one for me, real nice. Thanks! A2 ist mein Favorit! Der beste Techno, den ich seid langem gehört habe! really digging that 'berenklauw' original! I like B1 and B2. Thank you! Realy nice EP! Full support from here esp. for A1!! Great release! The Rocco Caine and Acensor remix is one of the better things I've heard all year. I love the A1 too! This EP kicks Asses.. Really Sick!